Representatives from state agencies in Connecticut, Maine, Massachusetts, New Hampshire, Rhode Island, and Vermont met earlier this month to hear and discuss reports from multi-state workgroups related to Certificate of Need reform and hospital regulatory issues, improving the value of community benefits reports, data-sharing opportunites, and primary care investments. The meeting was sponsored by the Milbank Memorial Fund, the National Academy for State Health Policy, and the New England States Consortium Systems Organization (NESCSO), a non-profit corporation organized by six New England Health and Human Services agencies and the University of Massachusetts Medical School that seeks to foster communication and collaboration between its members. Read about the recent Fund/NESCSO meeting. 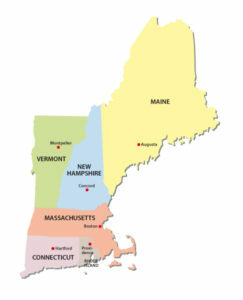 Launched in 2017, the Primary Care Investments Workgroup included representatives from four of the NESCSO states—Connecticut, Massachusetts, Rhode Island, and Vermont. The group’s main goal was to explore opportunities for improving primary care by comparing each state’s strategies and activities. During meetings over the past year, the group engaged in discussions about each state’s approach to primary care investments, including the state’s policy environments and data capabilities, and potential opportunities for collaboration. Using the 2017 Milbank Memorial Fund report, Standardizing the Measurement of Commercial Health Plan Primary Care Spending, as a starting point, the group compared each state’s definition of primary care to the report’s specifications and considered the measures used by Oregon for its primary care spending report. How to define primary care and primary care spending. Why states should consider increasing investments to primary care providers and primary care practices. What are the components of primary care investments. What tools states can use to establish and achieve goals related to primary care investments. How to measure the success of primary care. What opportunities exist for further collaboration among the states. Next steps for states to consider to further strengthen primary care. Working from the common set of primary care spending measures, each state selected their key data elements and applied them to their own state data sets. A comparative look at primary care payments in four New England states is provided in the table below. It is important to define what is meant by primary care services, primary care providers, and primary care payments (claims-based and non-claims-based). It is important to measure primary care investments and develop measures of success related to those investments. It is important to define the data required to support the “measures of success” and to determine how that data will be collected and reported. There may be opportunities for interstate collaboration to consider common regulatory approaches to ensure accountability among payers and providers. Continue work on the evolution of payment models, primary care investments, and measures of success related to the cost, quality, and access to health care services and the impact on population health. Define the major contributors to the “administrative burden” on primary care providers and suggest potential opportunities to relieve those burdens in areas such as prior approvals, complexities of performance measures, claims denials, and billing processes. Document current approaches to risk adjustment used in primary care payment models and how they affect care delivery and payment amounts. Go to the Primary Care Spend Resource page to learn more about the workgroup’s findings.